I had seen this Chanel foundation being mentioned on blogs and on various YouTube channels and I really wanted to try it out, but I knew that I didn’t really need another foundation in my already vast collection. But then one day I was stood at the Chanel counter in Boots whilst I was on my dinner because I was restocking on my trusty Chanel No5 and I saw it sat on the shelf and before I knew it, I was checking out with it and I was the proud owner of the Chanel Perfection Lumiere Foundation. And I have to admit, I have been completely in love with this ever since and I reach for it all of the time! 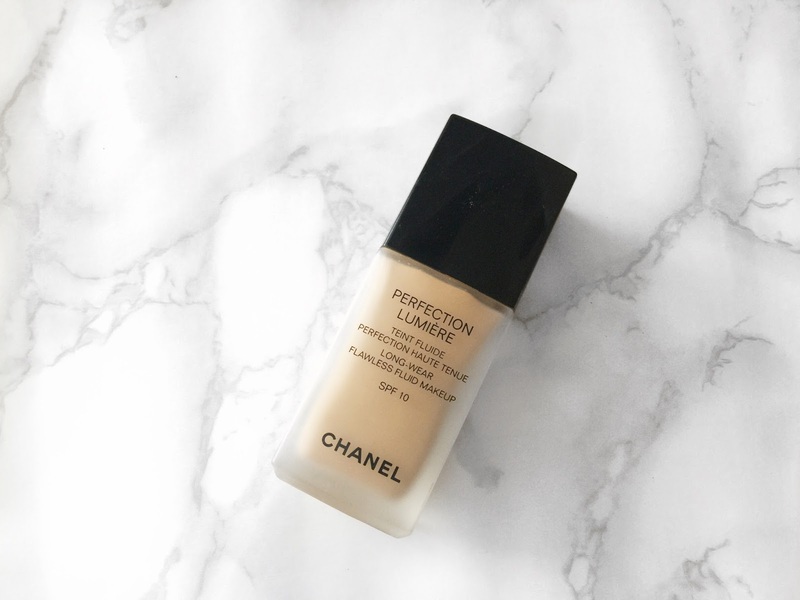 Before I used this foundation, my absolute obsession with a foundation was the MAC Studio Fix Fluid and even though there are similarities between the two, it is the differences which make me love this Chanel Perfection Lumiere Foundation so much more. I will go through the different aspects in this review on what I thought about this foundation and hopefully from there, you may be able to realise if it is the foundation for you and if you want to give it a go. Anyway, here is my review on the Chanel Perfection Lumiere Foundation. First up, I want to talk about the packaging. I like to start on the packaging, because to me that is the first thing that I notice about a product. I love how this foundation looks, it is very sleek, chic and Chanel-esque. I love the frosted glass bottle because it is incredibly stunning. Another thing that I think is great is that it comes with a pump because we all know that is a bugbear of mine. I think that the packaging does look very high quality and it makes it a little easier parting with £30 if you get a beautiful bottle like this. I also love that when you pick this up from the counter in store you get a beautiful little Chanel bag which feels very luxe! Now, I want to talk about the coverage of this product because I think that is so important when I am talking about a foundation. I would say that this has a medium to full coverage. If I go in and apply a light layer of this Chanel Perfection Lumiere Foundation, I will have a medium coverage which hides most of my imperfections, but my dark circles and certain areas of my hyperpigmentation will not be covered. If I go in with just a touch more foundation on my buffing brush or Beauty Blender, I can build up the coverage to a lovely full coverage which hides everything. Even when I have a full coverage application of this foundation on my face, I still find that it is lovely and lightweight on the skin. Don’t get me wrong, it does feel like you are wearing makeup. Consistency wise I would say that it is somewhere between the MAC Studio Fix Fluid and the MAC Face and Body. I have never had an issue with how this foundation applies to the skin and it always seems to sit beautifully and never accentuates any of my problem areas or make me overly oily. One thing about this Chanel Perfection Lumiere Foundation that I feel I should mention is that it is a scented product. I know that hell of a lot people don’t like scented products either just because of personal preference or due to sensitive skin, but it isn’t something that really affects me. I have very normal skin and in actual fact, I quite enjoy using this product because of the scent. I find it to be very refreshing when I am applying it first thing in the morning and I am sure that most people will be aware that I am a huge fan of Chanel fragrances. I will say that I am very lucky when it comes to this foundation because it is quite easy to find my shade with me having a medium/tanned skin tone. I will admit that if you are looking for a very light skin tone or a deep shade, you will probably struggle to find your shade because the shade range is pretty limited. Hopefully, over the years they may bring out some more shades to make it more of an inclusive foundation shade range. I think that this is a really great foundation and I know that it is going to be one that I repurchase over the years. I love how it covers, how it sits on the skin and how it looks. I will leave a link to this foundation down below in case you want to check it out for yourself. Make sure to leave me a comment and let me know if you have tried this foundation and let me know what you think about it or if you want to try it out!